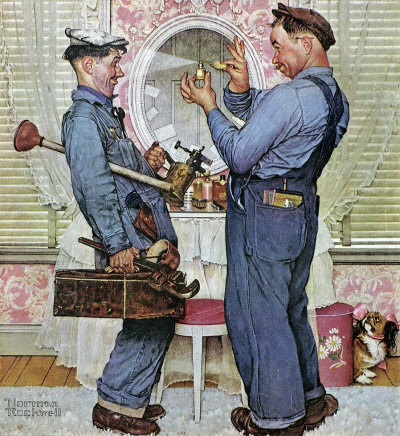 Two Plumbers, a Norman Rockwell painting , appeared on the cover of The Saturday Evening Post published June 2, 1952. This is yet another favorite of Rockwell collectors, a classic enduring image of the world Rockwell painted. This painting was Rockwell's 267th overall out of 322 total paintings that were published on the cover of the Saturday Evening Post. Rockwell's career with the Post spanned 47 years, from his first cover illustration, Boy With Baby Carriage in 1916 to his last, Portrait of John F. Kennedy, in 1963. This was also the first cover for The Post in 1952. In 1952, there were three Norman Rockwell Saturday Evening Post covers published. The original oil on canvas painting, 20 x 9.5 inches or 51 x 24 cm, is part of a private collection. on page 187 of Norman Rockwell, A Definitive Catalogue by Laurie Norton Moffatt. A study also appears on page 188 of the Norman Rockwell Catalogue. In this painting, Norman Rockwell shows us how much fun a job can be. The two fellows are working. But the only way to tell that is by looking at the tools they are carrying. Their faces and demeanor suggest that they are really having fun. The plumber squeezing the perfume on the other seems to be the boss of the two. He has the billing book in his back pocket. The plumber who will smell the best when they leave is carrying all the tools. His coveralls also look more soiled than the boss's look. This comical scene is handled with Rockwell's usual adeptness. We are left laughing with the plumbers, not at them. Two Plumbers was only one of 322 Norman Rockwell Saturday Evening Post covers; Here is the list of Norman Rockwell Saturday Evening Post cover illustrations. Another observation is how beautiful the room is. The pinks in the wallpaper, waste basket and stool cushion all match and compliment the white curtains and carpet..
And, of course, the Pekingese watch dog is on duty to make sure that everything is left in its place when these two finish playing. Do You Have A Great Story, Opinion Or Contribution About Two Plumbers?